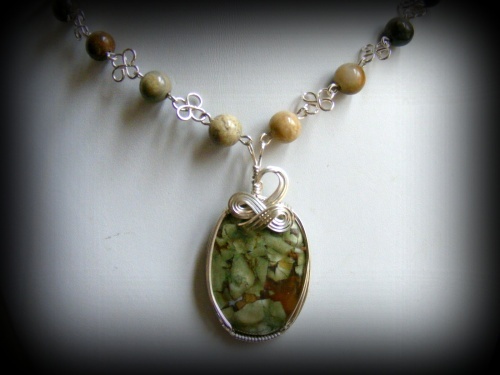 This beautiful Jasper gemstone focal has rich browns and greens going through the stone and embellished with sterling silver curls. Necklace part is also made of Jasper stones with varying earthy colors of tans and browns and greens, also the necklace part has clover like handmade pieces interlocking the beads. Piece measures 18" long and has a locking sterling silver box clasp with a small citrine embedded into it. Comes with matching earrings.